Who are our Super Trans* Peers? It's ok to be trans* you are not alone. All peers follow the QuAC code of conduct and confidentiality policy. All peers have access to a network of supportive professionals and a referral list for extra suport. 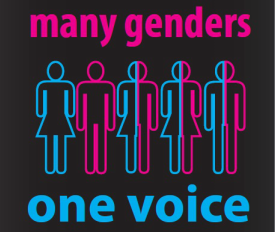 All peers listed have attended training and been approved by the Many Genders One Voice committee to be reviewed annually. These contact details are current from 25/09/14 and this program will run until June 2015. Scroll down and find a peer that suits you and contact them for support. Description: Good at supporting others to contribute and participate in healthy trans* communities. I am passionate about helping others create their lives how they want. Have been part of the queer community for 30 years, first as a lesbian, now as the partner of a trans-woman and have a background in coaching/mentoring. Ability: to mentor/support trans* adults and their partners. I am a member of the queer community as well as being a willing volunteer to help others. I love to talk about art and design. I am a professional counsellor with a key interest in helping the trans* community. I would like to make a difference in the lives of people who often lose their voice due to difference or diversity, which is something that I think we as society members should love and embrace as a true reflection of human kind. I would like to help support/advocate for people so that they do get heard and are treated respectfully, as is every human being’s right.